Harold Mitchell delivered these introductory remarks at the inaugural Harold Mitchell Development Policy Lecture on November 22nd at the ANU. We’ll be posting the speech of Timor-Leste’s Minister of Finance, Emilia Pires, soon. You can listen to the podcast here. Ladies, gentlemen and distinguished guests, it is such a pleasure to be here today at the inaugural Harold Mitchell development policy lecture. And how lucky we are to attract such a brilliant speaker! I am a great admirer of Emilia Pires, and her work as Finance Minister of Timor-Leste. This was the beginning of a close and enduring friendship, and the first of many times that I’ve tried to help. I’m currently supporting the former Victorian Premier, Steve Bracks, in his role as one of Xanana’s advisers. And I’m also helping Xanana’s wife, Kirsty Sword Gusmao, in her quest to improve maternal health and education. As Kirsty says, supporting women is absolutely critical, when it comes to alleviating poverty and promoting development. I am also pleased to support CARE implement two if its projects in Timor. So Minister, can I just say that’s it’s been a privilege to get to know your beautiful country and to do what little I can. It’s a wonderful place. Now, let me turn to today. Why are we all attending a Harold Mitchell Lecture? The answer begins with my strong belief that Australia is a lucky country. Our creativity, our proximity to Asia and our abundance of natural resources have made us a place with unique opportunities. But how can we make the most of them? Both professionally and on a philanthropic level, I’ve recently become very focussed on how we, as a country, can prosper. And I think that much depends on what we do in our region. Australia is one of the only developed nations that is almost entirely surrounded by poor countries. Helping those countries to develop is not just a matter of being a good global citizen. It’s a matter of ensuring our own security and progress. It’s for this reason that I’m a strong supporter of foreign aid – and would really like to see us give more. I’d like to commend Peter Baxter and his AusAID team for the great job they do. They are managing an increasing aid budget with Australia as one of the world’s top donors. But of course, an effective aid program has everything to do with how we spend. It’s not just about how much. The United Kingdom and the United States both have independent think tanks to keep their aid programs transparent and accountable, and continually fed with fresh ideas. And now we do too. I think that the ANU’s Development Policy Centre is set to make a huge contribution to aid policy debates, both at home and abroad. I don’t just see it as an asset for big institutions such as AusAID, but a boon for everyone in the development field. This includes NGOs such as CARE Australia, of which I am Chair. Of all the things we can do to support good development in our region, supporting a contestable environment is one of the most important. The war against poverty starts with a battle of ideas. So that’s why I’m here to help. 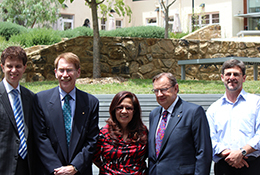 Today, I am pleased to announce a grant of $2.5 million over five years to the ANU Development Policy Centre. This grant will cover core administration costs, and allow Professor Howes and his team to focus on their most important job: delivering a world class think tank. I congratulate Professor Howes and his team for their significant contribution to development in our region. And I can’t wait to watch them grow. Harold Mitchell AC is founder of the Harold Mitchell Foundation and Chairman, Aegis Media, Australia and New Zealand. For more on the Harold Mitchell Foundation gift, click here. Harold Mitchell AC is founder of the Harold Mitchell Foundation and Chairman, Aegis Media, Australia and New Zealand. This way of thinking should be commended. And maybe this is what ‘donor’ countries should be promoting across the developing world as well. Think tanks in developing countries are unfortunately too dependent on foreign funds (directly or indirectly provided by aid agencies like AusAid for example). Local philanthropy is indispensable when it comes to promoting the battle of ideas that, I agree, is necessary to fight poverty (and the causes of poverty) because without it local think tanks, academic research centres, party affiliated think tanks, NGOs, etc, cannot thrive in the long run. I often think that instead of increasing their research funds to think tanks and research centres in developing countries donors should seek instead to mobilise local billionaires (and millionaires) to pick up the bill. They exist; but as is too often reported in countries like India they prefer to endow Harvard or Oxford than research centres in their own homes. This needs to change: new legal frameworks are necessary but peer pressure (or inspiration) may be sufficient to get the ball rolling. This kind of effort may not offer quick wins but is certainly cheaper and more sustainable in the long run. Without local philanthropists researchers will continue to operate within rather narrow spaces of manoeuvre -always trying to pre-empt the interests of their foreign funders or the ‘northern’ intermediaries who sub-contract them to work on text boxes or case studies using someone else’s theories or frameworks. This is the difference between Chile and Bolivia! In the former, foreign funding kickstarted a process that led to the emergence of new philanthropists. In the latter, foreign funding remains the most important if only source of funding. It should be noted though that while the US does have independent think tanks dealing with international development policy (Brookings, CGD, etc.) this is not necessarily the case in the UK. There, all ‘think tanks’ are directly and indirectly funded by DFID. So DPC should consider itself as part of a very select club. I have listened to Mr Mitchell each morning with ABC Local (666) when he is in town. I am very pleased that Mr Mitchell looks at the issues beyond our border. If Australia, a vast nation with a small population leads development in Asia and Pacific in the next 50-100 years, poverty could be reduced, diseases could be treated and local resources could be sustained. ANU’s Development Policy Centre could save lives of many disadvantaged people in Asia and the pacific. However, very few local people in Asia and Pacific can read English and are able to understand policies and principles of Aid and Development. Can, we (Australians), led by ANU and Mr Mitchell also support those who wish to learn English in their home country? If more of the population could read and is able to access information online in 2020, then at least they are informed on what donors do and how they work in their country. In fact, access to Education and health is the foundation of development. If we look at poor school infrastructure in many countries such as Myanmar, my native county, it is clear that access to education is poor. If Mr Harold also wishes to help other poverty issues, I wish he could build 100 schools in poor country in his lifetime that also stamp his name on each school front gate. This is possible because he has the wisdom, knowledge and above all ‘human touch’ spirit. Thank you Mr Mitchell. God Bless You!